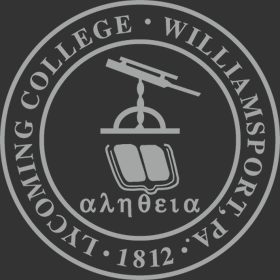 Lycoming College’s David Broussard, Ph.D., assistant professor of biology, and biology major Cayla Treaster ’19 of Williamsport, recently presented their research at the 130th Geological Society of America Annual Meeting in Indianapolis. The Geological Society of America, which was established in 1888, promotes the professional growth of geologists involved in a variety of sectors such as academia, government, business, and industry. Their annual conference welcomes more than 7,000 geological professionals from around the globe, including earth scientists at all levels of expertise. Treaster’s poster presentation, entitled “Paleoenvironmental Variation of an Especially Fossiliferous Late Devonian Alluvial Plain Deposit in the Catskill Formation of North-Central Pennsylvania,” focused on the various paleoenvironments preserved in layers of rock dense with fossils. 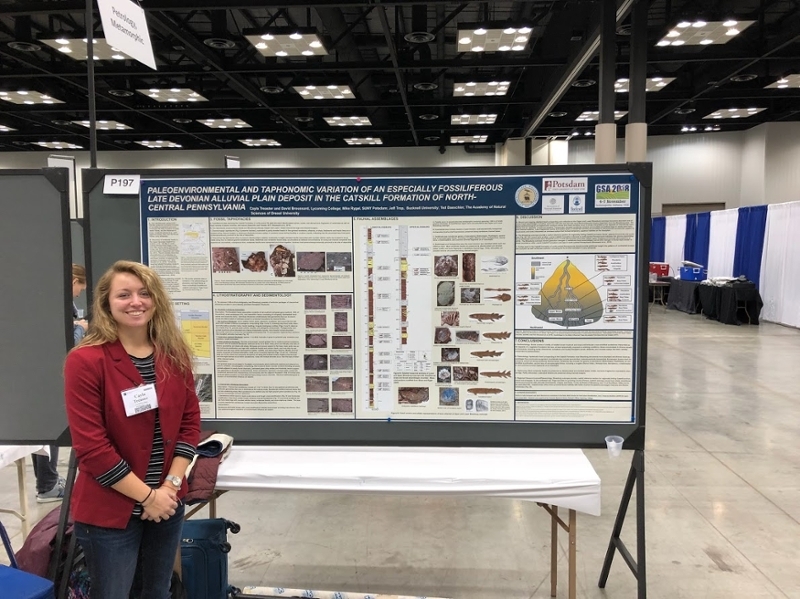 She created her poster based on her summer research at Catskill Formation outcrops near Blossburg, Pa.
As a Haberberger Research Scholar, Treaster’s research and presentation were supported in part by the Arthur A. Haberberger Chairman’s Endowed Student-Faculty Research Program. Broussard, who also presented at the conference, delivered a lecture entitled “Temporal Changes in Latest Devonian Vertebrate Fossil Assemblages in North-Central Pennsylvania: A Consequence of Mountain Building, Glaciation, and Environmental Change?” His talk highlighted the decrease in vertebrate fossil abundance and diversity moving upsection (into younger rocks) in the Latest Devonian period from the Catskill Formation into the Huntley Mountain Formation in Tioga County of North-Central Pennsylvania. He attributed the reduction of fossil abundance to a cooling climate and glaciation at the end of the Devonian period, resulting in major changes to aquatic habitats making them suboptimal for Late Devonian vertebrates including fish and early tetrapods.